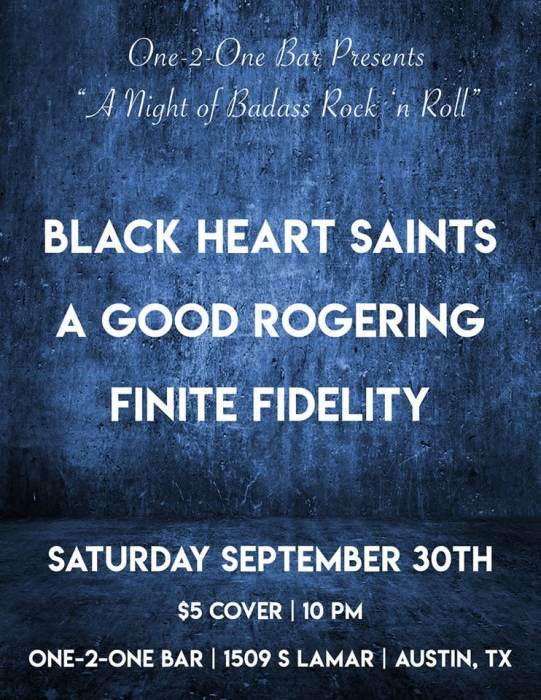 With a dynamic, original sound founded upon an explosive stage show, Black Heart Saints surrounds audiences with unapologetic, aggressive rock that begs to be experienced live. After debuting at SXSW in 2014, this powerhouse quartet has been building a solid reputation as a support act for national touring bands such as Slash featuring Myles Kennedy & The Conspirators, Sevendust, Nonpoint, Coheed and Cambria, Filter, POD, Tantric, Everclear, Pop Evil, Alien Ant Farm, and more. In 2014, Black Heart Saints represented their hometown at the ESPN X Games in Austin, and performed along with several national headliners such as Kanye West, The Flaming Lips, Gary Clark, Jr., and more. Last year wrapped up with several completed regional tours, which have firmly established the band as a premier force in new music. 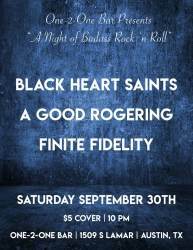 The band’s first release – “Black Heart Saints EP” – is currently getting radio play on several FM stations throughout Texas and the West Coast, and has received overwhelmingly positive reviews by some of the most prominent rock critics and bloggers, which has boosted demand for the band’s live appearances tremendously. Currently topping online music store sales charts, the EP has also enjoyed success at select retailers such as Austin’s own beloved Waterloo Records. 2015 kicked off with key performances during SXSW 2015, Texas Rockfest, and Fiesta Oyster Bake in San Antonio. The band also went back to the studio to record a string of upcoming singles produced by Omar Vallejo at Austin’s renowned 512 Studios. After debuting their first official music video for the hit single “Touch The Sky” on MTV, VEVO, and YouTube, Black Heart Saints is poised to launch a memorable international career with ambitions to dominate stages across the globe. Half-way through 2016, the band gained nationwide airplay on Sirius XM’s Octane and Faction channels. Released in September 2016, the single “Gasoline” features an accompanying music video produced by acclaimed director Taylor Fredricks. Most recently, the band has been catapulted to the forefront of Texas hard rock after supporting POD, Skillet, Adelita’s Way, Ratt, and Puddle of Mudd on their Texas tour dates. An action-packed summer 2017 kicks off with the release of the full-length album entitled “ALIVE” as well as the “Road to Sturgis Tour 2017” will put Black Heart Saints’ charismatic live performance to the test when the band takes the stage at the world-renowned motorcycle rally, which is predicted to see be attended by over 500,000 bikers from all around the globe. Driven by the baser instincts of their ancestral caveman predecessors, A Good Rogering is a band that delivers a raw and powerful sound best described as eclectic heavy-rock. Their latest EP, "This Is Death Metal", is the band's strongest release to date paying homage to their metal roots and love of a solid groove. Currently on tour, AGR continues to captivate audiences across the country with their intense and engaging live shows.